Marvelous holiday home with private swimming pool, on a hilltop near Lajatico, close to Volterra, in splendid panoramic position. 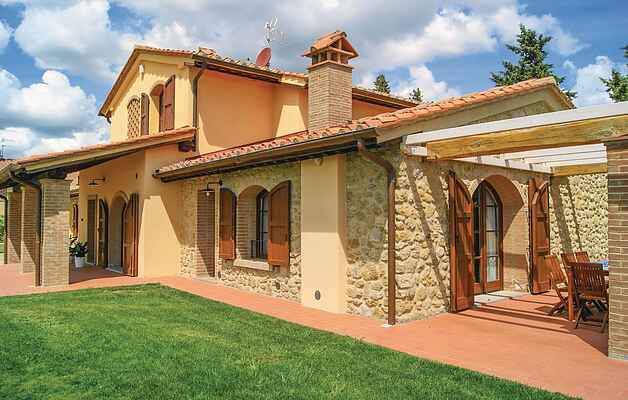 The estate features large outdoor spaces: a covered loggia, two partially covered patios, one of which equipped with barbecue, table and chairs for alfresco dining, partially fenced grounds all around the house. This accommodation is particularly recommended for families with children who will enjoy the small playground in the garden, with slide and swing, and the shallow in-ground pool measuring 2x5 mt. The relax outdoor area features a beautiful in-ground infinity pool with lighting and whirlpool, measuring 10x5 mt, outdoor shower and sun loungers. Larger groups may reserve this property together with the adjacent house ITP571. The villa is located in the beautiful hills of the Valdera, between Pisa (58Km), Lucca (63Km), Firenze (80Km), and it’s close to Volterra (16Km). The closest town is Lajatico (7Km), but various services and shops are only 3Km away. It’s a good starting point to visit the main art towns of Tuscany. Moreover, the Teatro del Silenzio in Lajatico is a world-renowned location for acclaimed and unique events, such as the concert arranged by the Andrea Bocelli’s foundation, once a year in summer. The surrounding nature invites you to stay outdoors, thanks to the many hiking trails of the area. Full-day trips to the seaside can be easily planned, as the beaches of Castiglioncello and Marina di Cecina are only 45Km away; thermal baths at 26Km, golf course at 35Km; fishing in the river Lera at 5Km. Outdoor parking place for 5 cars. Baby cot and highchair available for free. The villa has an alarm system. It features typical terracotta tile floorings and beamed ceilings and it’s organized on two floors. The ground floor features a living room, living room-dining room with large kitchen and access to the outdoor patio, three bedrooms with satellite TV, three bathrooms with shower, laundry room. Three more double bedrooms, with private bathroom and satellite TV , on the first floor.